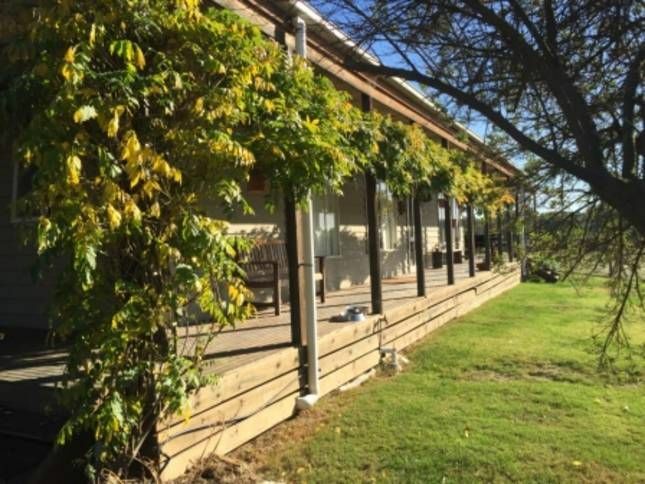 Woolly Slopes is situated just 5 minutes from Hepburn Springs and Daylesford. A fully self contained home situated on 63 acres of undulating hills. Take some time out on the porch as you watch the sun rise over the hills in front of you and then take a wine and enjoy the evening light play over the hills of Mt Franklin. The house is beautifully decorated and comfortably sleeps 6 people as well a precious pets! A large open kitchen, dining and lounge area is great for friends or family to get together and enjoy the views from indoors or out! All creature comforts are provided all you need to do is relax! Lovely house on a beautiful property. This is a beautiful property with amazing views. It's very well kept and clean. The beds were very comfortable, the rooms cosy and tastefully decorated. The lounge was so warm and cosy with the fire going. Kitchen has everything you need. My two young boys loved exploring the property and going off on adventures to find the sheep. We saw kangaroos and kookaburras and Nessie the little black dog came and visited a few times. She is very sweet! Just looking out over the hills is entrancing. The property is only 10 mins drive outside Daylesford. It's a lovely place to stay. Thank you for your hospitality. Such a wonderful property - warm fire, plenty of wood, beautiful views. The hosts have developed a fantastic home away from home. We have thoroughly enjoyed our stay. The view from the house is beautiful! Thank you to the hosts for allowing us to share such a wonderful property. We thoroughly enjoyed our stay at Wooly Slopes for a girls weekend away. The property was easy to find and had amazing views. The house was spacious and had everything we could ask for - even the dog had a ball (and has slept solidly since)! The local wildlife came to check us out... Kookaburras and a whole bunch of Kangaroos! The property is about 10 minutes out of Daylesford but feels like you're in your own little world! Thank you so much Justine and Missy for letting us stay at your lovely house - we've left you a bottle of red from our favourite vineyard. Great house, in rural setting. The kids loved the kangaroos!